Construction of the new Metropolitan line station was accomplished by filling in the running tunnel to provide a concourse and diverting the tracks into old tunnels that ran outside of and parallel with the original running tunnels - the old tunnels were short City Widened Lines westerly extensions beyond the junction where they veered north to St.Pancras. (This page deals only with the Metropolitan line part of the station. The Widened lines / Thameslink side is dealt with on its own page). According to two ex-pats; Ian Simpson and Dewi Williams, the western end of the replacement Kings Cross station had a bay platform for terminating trains. It was of six-car length but was rarely used as the norm was for eight-car trains after the war. It remained until the 1960s but was mostly filled in, leaving just the short section shown here. 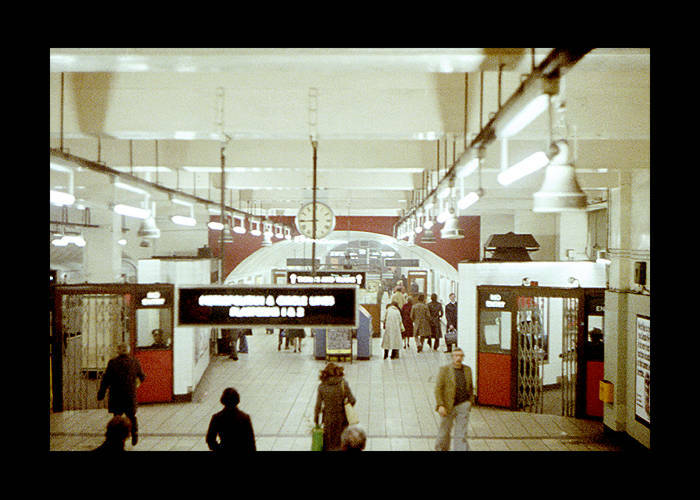 The changing face of the old running tunnel at the replacement Kings Cross station: in the late 1970s and (moving your cursor over the image) in 2006. The old station looking west. The westbound platform is visible here but (most of) the eastbound platform was utilised for the Thameslink station next to these lines. The Thameslink station itself closed in 2007. The old station looking west. The photo is taken from the eastbound platform, which used to also serve the northbound Widened lines. View of the open air part of the old station, again from the eastbound platform but looking in the opposite direction from the photo above. View of the stairs on the eastbound platform. From the same position as the photo above but looking at the westbound platform area and its steps. The tracks are hidden by the cables in the foreground. From the same position as the photo above but now looking straight down toward the scant remaining section of the eastbound platform. Looking down at the eastbound platform from the top of the stairs. View from the crossover bridge at the stairs leading down to the westbound platform on the left, and the subway under the road toward Kings Cross mainline station, on the right. Looking back at the crossover bridge. The subway underneath Grays Inn Road heading toward Kings Cross mainline station. The light visible in the blackness in the distance is daylight coming from a street vent. The tunnel now sealed off at a point very close to Kings Cross mainline station. Heading back toward the old tube station. There is some evidence of repair work to the ceiling here.